For the 12th year in a row, Oregon ranks in the top 10 most energy-efficient states in the country—according to the 2018 State Energy Efficiency Scorecard by the American Council for an Energy-Efficient Economy. Massachusetts preserved its top ranking for the eighth consecutive year, followed closely by California and Rhode Island. 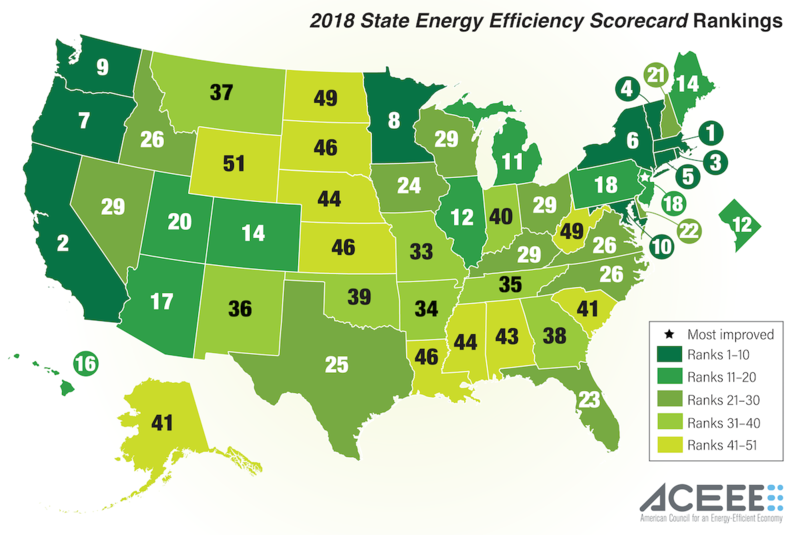 The 2018 state scorecard benchmarked states according to policies and programs designed to improve energy efficiency in homes, businesses, industry and transportation. States were scored on six policy areas: utility and public benefits programs and policies, transportation policies, building energy codes and compliance, combined heat and power policies, state government-led initiatives around energy efficiency, and appliance and equipment standards. The work of Energy Trust of Oregon, Northwest Energy Efficiency Alliance, Portland General Electric, Pacific Power, NW Natural, Cascade Natural Gas, Avista, the Oregon Department of Energy and Bonneville Power Administration contributed to Oregon’s rank, as well as state policies and Oregon Public Utility Commission regulations. Last year Oregon was ranked in the top five, however this year the state was surpassed by two close competitors, Connecticut and New York. Connecticut expanded the state’s renewable portfolio standard and passed legislation to ensure efficiency funds in the 2019 budget, while New York announced an aggressive New Energy Efficiency 2025 Target. In ACEEE’s 2018 City Energy Efficiency Scorecard Report, Portland was ranked the fourth most energy-efficient city in the nation, close behind our northern neighbor Seattle. Portland scored high in all five ranking criteria: local government operations, community-wide initiatives, building policies, energy and water utilities, and transportation policies. These report findings demonstrate that states and cities investing in energy efficiency programs and policies are saving energy and money, encouraging technological innovation and improving the resiliency of communities. Visit ACEEE’s website to see an executive summary or the full report of the state and city rankings.